Eucalyptus, a genus of over 800 species, is a multiproduct crop par excellence. Not only is it grown for timber, pulp and fuelwood, but, as the Aborigines discovered thousands of years ago, it has numerous medicinal and aromatic properties. Since the first commercial distillation of eucalyptus oil 150 years ago, a vast array of eucalyptus-based products has entered the marketplace, mainly for pharmaceutical, fragrance and flavor use. Eucalyptus provides an invaluable reference for all those with an interest in Eucalyptus - in academia and industry alike, for researchers as well as producers, processors, importers and end users - but there are also issues discussed and lessons learned that extend to medicinal and aromatic plants. "[This book] provides in-depth, scholarly information on one economically important medicinal or aromatic plant. 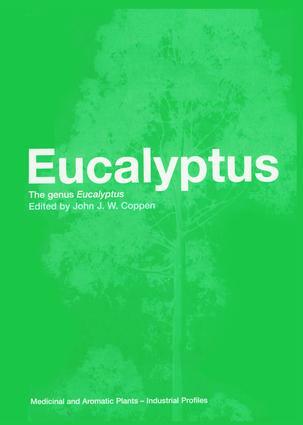 This is a well-written volume that covers a wide range of information about eucalyptus, from the botanical, agricultural and chemical aspects to its production and role in the world economy. The authors are recognized scholars in their fields … . Each chapter contains an extensive list of references … . This book is recommended for academic and research libraries with botanical and agricultural collections." "Each chapter is written by an expert in their particular field and thus the whole volume presents comprehensive factual data on all aspects of a selected genus … . In all, this is a gem of a book that has much to offer across a broad range of disciplines connected to the essential oil and medicinal plant world." Part 1. General Aspects Part 2. Cultivation and Production of Eucalypts Around the World: With Special Reference to the Leaf Oils. Appendices: Sources of Eucalyptus Seed. Estimates of Eucalypt Plantations Worldwide. Advice to a Prospective New Producer of Eucalyptus Oil or Other Leaf Extractive. Composition of Some Commercially Distilled Eucalyptus Oils. Quality Criteria and Specifications of Eucalyptus Oils. Packaging and Labeling Requirements for the Handling and Transportation of Eucalyptus Oils. Useful Addresses.